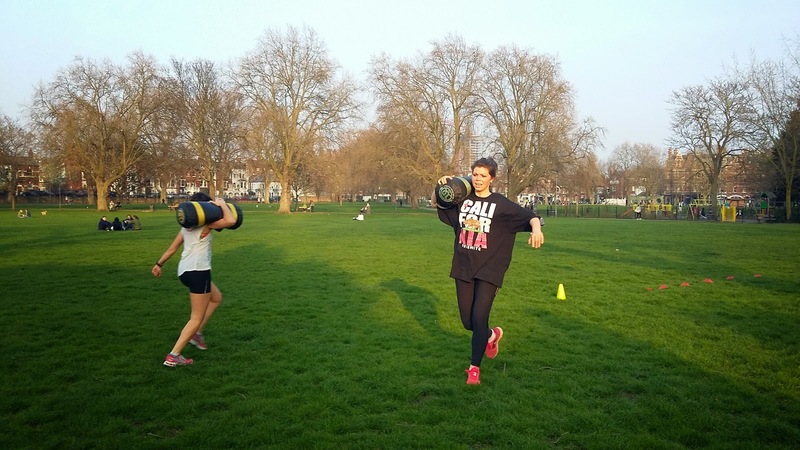 Sweaty Betty bootcamp in the Spring Sunshine! On Thursday evening, I was running home from work as usual when I spotted some friendly faces in the park. 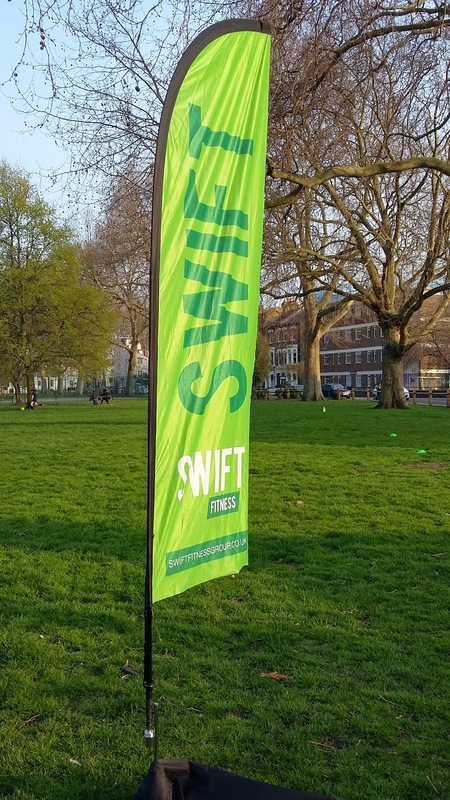 Swift Fitness now run Sweaty Betty’s free workout sessions in Eel Brook Common every Thursday at 6pm, so I joined them for a workout. 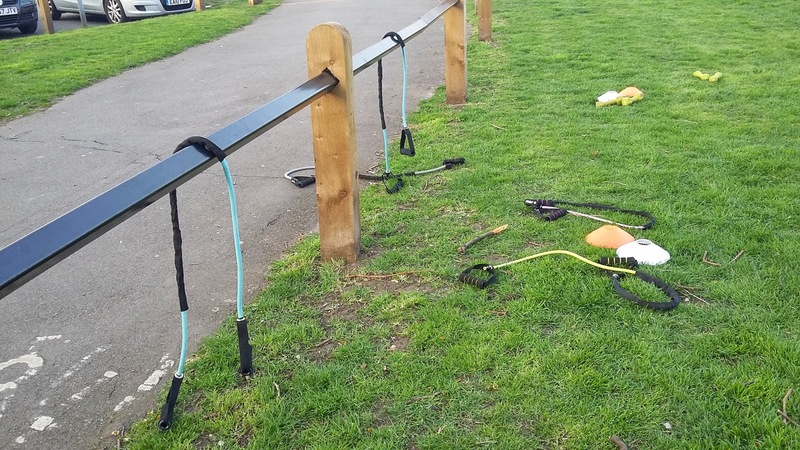 It was a glorious evening and the park was full of dog walkers, kids on Easter holidays, runners and yoga bunnies, but our instructor Sam set up our workout area in a free corner and we began warming up. Skipping. Skipping is hard! I remember when I used to love it at school, crossing over the ropes, seeing how long we could go for without stopping. Such an easy way to get your heart rate going and warm up both arms and legs. Next up, some sprints and agility work. Working in teams, we ran between cones working on our kneeling sprint starts, footballers’ weave, high knees and even backwards running. Strength training next and a circuit of kettlebell squats and shoulder presses, bicep curls and rows with the fitness bands, boxing with handweights and my favourite, sandbag runs! Lastly, the core section, and another circuit of eight exercises including planks, toe taps, curls, Russian twists and bicycle crunches to finish before our stretch. Despite the recent warning of exercising outdoors last week due to air pollution (DEFRA), parks away from main roads are one of the safest environments to work out, especially in a group led by a trainer. You can leave bags next to your workout area and just need to turn up wearing something comfortable with trainers, and maybe a bottle of water to keep hydrated. The Swift Fitness instructors will put you through your paces and guide all abilities and fitness levels. All Sweaty Betty workouts are free, you just need to sign up through their website. I find a lot of the classes held in their boutiques fill up quickly but you can usually get a place in ones held outside as numbers are less restricted. 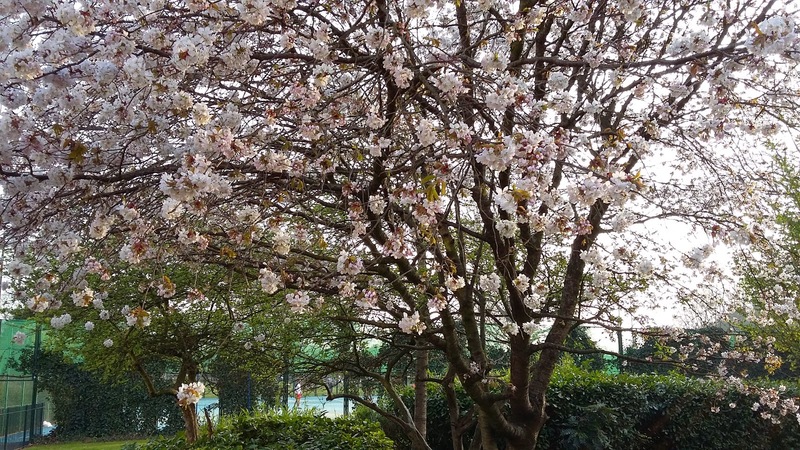 Here’s to the start of Spring in London and more outdoor workouts in the fresh air! Will you be changing up your workout to include more sessions outside?